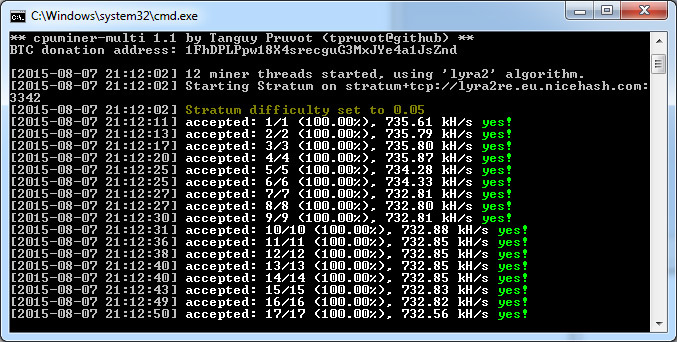 It has been a while since there has been an official release of the cpuminer-multi fork from tpruvot though he was working actively on the source code of the CPU miner with multiple algorithms supported. The cpuminer-multi is the most functional fork of cpuminer that comes with support for the largest number of algorithms and a lot of optimizations for them to get you the most performance out of your CPU. Do note however that some dedicated forks of cpuminer for a specific algorithm may still provide better performance, but if you want flexible solution with many algorithms supported then cpuminer-multi is the choice. The latest official binary release version 1.1 comes with many new algorithms added including GroestlCoin, Diamond and Myriad, Pluck algorithm, ZR5 algo (ZRC), Luffa algo, Skein2 algo (Double Skein for Woodcoin), Animecoin algo (Quark variant), Dropcoin pok algo, BMW-256 (MDT) algo and the Axiom algorithm. There is also a basic API remote control some other new features and fixes. Do note thta if you want to get the latest updates you should always compile from source as we are not seeing often official binary releases, though the 1.1 should be up to date for some time now.